Summertime is a spacious, airy, private luxurious holiday villa set in the exclusive Silver Sands Estate and offering four air-conditioned bedrooms each with an en suite bathroom and a perfectly maintained private swimming pool. 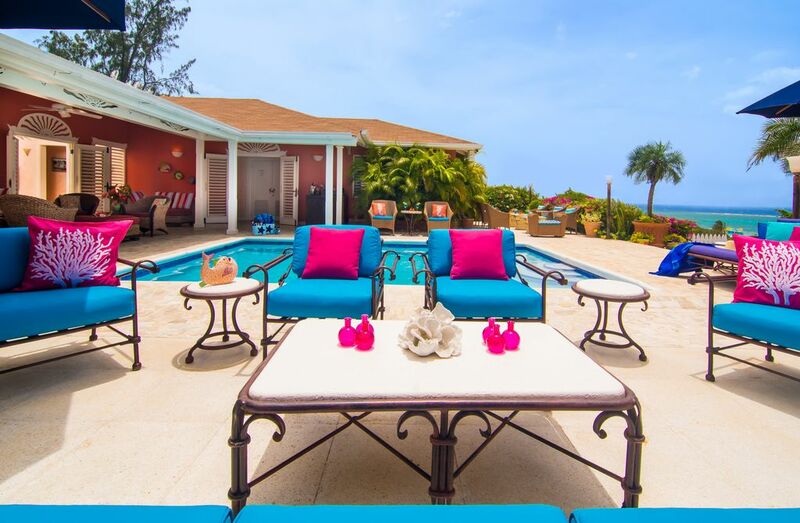 This sunny villa with its tropical decor throughout, promises a unique Caribbean experience. Plunge into the cool blue depths of the private pool, or relax on the famous 'Silver Sands' beach and soak up the Jamaican sunshine, and as the dusk gives way to night, enjoy delicious meals in the elegant indoor dining room or under a starlit sky with the tropical night chorus in the background. The L-shaped verandah flows into the pool deck from where there is a panoramic view of the Caribbean sea. Lots of lounge chairs add to the comfort of relaxing poolside. Summertime’s pool and patio areas, as well as its outdoor back loggia, provide the perfect ambience for total relaxation. The villa's spectacular sea views allow guests to experience the dazzling tropical sunrise and sunsets. • Impeccable service - Professional Chef and Well-trained, experienced housekeeper, not forgetting Boris the gardener on hand - the Summertime team! • Large shady verandah flows out to private pool with lots of deck space, lounge furniture and drinks by the pool, of course! • Cable TV, DVD player, internet. • Secluded, beautifully maintained flowering gardens. • Every bathroom equipped with blow dryers, bathrobes and SPA bath products. Aqua fitness exercise equipment available.